Lettuce, tomatoes, cucumbers, onions, pita croutons sumac and mint topped with Osmow's famous dressing. Lettuce, tomatoes, cucumbers, green peppers, onions, chicken shawarma topped with Osmow's famous garlic sauce. Freshly prepared fava beans mixed with a variety of Mediterranean seasonings. Finely chopped fresh parsley, tomato, green onion, crushed whole wheat, lemon juice and olive oil. Ground chickpeas, tahini and lemon juice. Barbecued eggplant tahini sauce and olive oil. Fresh tomatoes marinated with olive oil, fresh herbs and layered with crushed feta cheese. Lettuce, tomatoes, onions, feta cheese, black olives and cucumbers topped with our famous Osmow's dressing. Lettuce and pita croutons topped with our famous Osmow's sauce. Lettuce, tomatoes, onions, cucumbers and green peppers topped with our famous Osmow's dressing. Fattouch, hummus, baba ganoush , tomato, feta and barbequed eggplant. 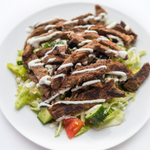 Lettuce, tomatoes, cucumbers, green peppers, onions, beef shawarma topped with tahini sauce and Osmow's famous sauce. 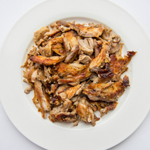 Slowly roasted boneless chicken, finely sliced and cooked to perfection. 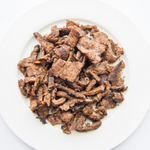 Slowly roasted beef, finely sliced and cooked to perfection. Marinated chicken breast grilled with onions, green peppers and pineapple. Boneless and skinless chicken breast cooked with mild curry and Mediterranean spices. 2 skewers of marinated chicken breast cooked with onions and green peppers. Marinated minced beef cooked with parsley, onions, tomatoes and Mediterranean spices. 2 skewers of marinated boneless lamb grilled with onions and green peppers. 2 skewers of freshly marinated minced lamb cooked with parsley, onions and green peppers. A combination of shawarma, lamb kofta, souvlaki and chicken breast grilled with pineapples. Beef steak with melted cheese, green peppers and onions. Chicken steak with melted cheese, green peppers and onions. Portobello mushrooms with melted cheese, green peppers and onions. A combination of fattouch, hummus, baba ganouch and falafel. Rice topped with chicken shawarma and special sauce. French fries topped with chicken shawarma and special sauce. Half rice, half fries topped with Chicken shawarma and Osmow's sauce. Rice topped with beef shawarma and special sauce. French fries topped with beef shawarma and special sauce. Half rice, half fries topped with Beef shawarma and Osmow's sauce. Rice topped with falafel and Osmow's famous sauces. Chicken shawarma and Osmow's famous sauce. Beef shawarma and Osmow's famous sauce. Please let us know what dish you'd like the extra garlic on or if you'd like it separate. Please specify what drink you'd like in the "special instructions" section.